The delightful common name of ‘Big Poly’, Eremophila bignonifolia x polyclada is a large flowered and fast growing Eremophila variety. It grows well in full sun to part shade and is more tolerant of soil conditions than many other species. The flowers are large, Mauve with white and bell shaped, the foliage a dark to mid green. This is a species that is easy to prune and could be used as a fast growing screen or hedge. In full flower this is a very attractive native plant, well worth a position in the garden. 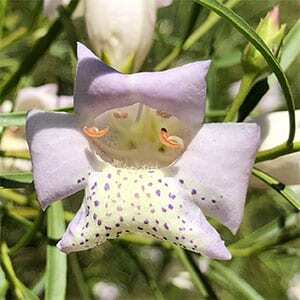 Planted in a sunny position in good soil this Eremophila hybrid is a very easy care garden plant. It does prefer a slightly acidic soil and reasonable drainage, however is tolerant of wet soils as well. Best planted in late summer to winter to allow for good root development and it is a plant that responds well to a little native plant fertiliser each spring. Common Name – ‘Big Poly Emu Bush’ Eremophila Big Poly. Growth Rate – Medium to fast depending on soil and rainfall. Spread – Can reach to 3 – 4 metres across. Flowers – Mauve with a white lip spotted with mauve.